I don't know what it is about books about midwives that appeals to me so much, but I can almost guarantee I will read a novel about them. Maybe it all began after I read (and loved!) MIDWIVES by Chris Bohjalian, or maybe it's because my first daughter was delivered by a midwife. 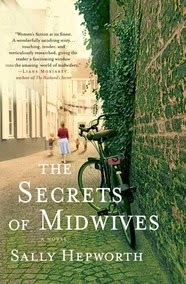 I'm not really sure, but I do know that the new book THE SECRETS OF MIDWIVES by Sally Hepworth looked terrific. THE SECRETS OF MIDWIVES tells the story of three generations of women who are all midwives. Neva Bradley is the youngest midwife and is trying to keep the details surrounding her surprise pregnancy a secret. Her mother, Grace, has very different ideas. Grace and Neva don't have much in common besides their occupation, and their relationship has been strained through the years. Neva does her best to respect Neva's privacy, but she just can't help herself -- she has to know! And then there's Floss, Neva's grandmother and Grace's mother. Floss is a retired midwife that is reminded of her own past when she learns that her granddaughter is going to be a single mother. The novel travels back and forth between the present and the past as the mysteries surrounding Neva and Floss's pregnancies come to light. If the truths are ever revealed, there will be consequences for all three women that could potentially have devastating effects on their relationships. I really enjoyed THE SECRETS OF MIDWIVES. The characters were interesting, as were the mysteries surrounding their lives; and I was definitely by the story. It actually ended up being a quick read for me in a time where I'm having a hard time finding much of anything I want to read! I won't go so far as to say that the book had any earth shattering revelations, and truth be told, it did wrap up pretty neatly; however, it was an entertaining novel all the same! One thing that definitely appealed to me about THE SECRETS OF MIDWIVES was the actual "midwife" aspect of the story. I thought Ms. Hepworth did a very good job with presenting the different types of midwives. Floss was a traditional midwife from England back in the 1950s, while Grace was definitely more of a "granola-type" midwife who did house deliveries and had disdain for doctors. Neva was a midwife who worked in a more formal, hospital-like setting with doctors. In addition to presenting the different types of midwives through these three women, the author did a great job of treating all of their practice methods equally. Actually, she did a great job of presenting all birthing options (doctor or midwife, natural or c-section, drugs or no drugs) as the right one... depending on the mother's preference. Another aspect of THE SECRETS OF MIDWIVES that I enjoyed was how well the author tied Neva and Floss's stories together. I can't go into too much or I'll end up giving away some of the surprises in the story, but suffice it to say that will their stories were similar in that they were both single mother. However, Floss's story definitely had a little more drama to it than Neva's. I appreciated how Floss, upon learning about her granddaughter's pregnancy, was sent reeling back into her past. Many of the secrets she'd been keeping for decades resurfaced, and she had to decide if telling the truth after all these years would do more harm than good. And finally, I liked that the story ended the way it did. Was I surprised by anything? Not really, and sometimes I have to wonder if everything was tied together a little too neatly with a pretty bow! Having said that, I think I would have been disappointed by anything else. I wanted a happy ending for these characters that I had grown to love, and I liked the themes about mothering and sacrifice. I'm sure you can already tell that THE SECRETS OF MIDWIVES would make a terrific book club discussion, especially if you're group is like mine and consists of moms. There is a reading guide with ten discussion questions. Some of the themes you might want to explore include secrets (of course! ), mother/daughter relationships, sacrifice, trust, privacy, marriage, love, birthing choices, single mothers, and family. THE SECRETS OF MIDWIVES is an entertaining read that will appeal to fans of women's fiction. Highly recommended! From the title, I thought this was historical fiction so I passed on it. Now I'm kicking myself. It sounds terrific! I hadn't heard of this one, but it sounds great! I like the idea of different threads weaving together through the different generations. Thanks for the review! I love books about midwives, too! I think I must have been one in a previous life or something. Will check this one out.